Simple, Safe and Cost-effective anaesthetic equipment. Following its acceptance in human anaesthesia since 1982 where it has been used in an estimated 15 million anaesthetics, the Humphrey ADE-circle now offers the same benefits in small animal practice. Subsequent to papers presented on research on cats and dogs at the BSAVA Birmingham UK congress in 2000 (Humphrey and Dobromylskyj), it was introduced into veterinary practice with much acclaim. It has been introduced as a simple easy-to-use cost-effective system to replace all others, requiring an average between 300-500 ml/min gas flow for all animals. Unique differences include a new 4-phase expiratory valve that regulates anaesthetic gas within the system in the most efficient way such that fresh gas flows are lower than with all other systems. 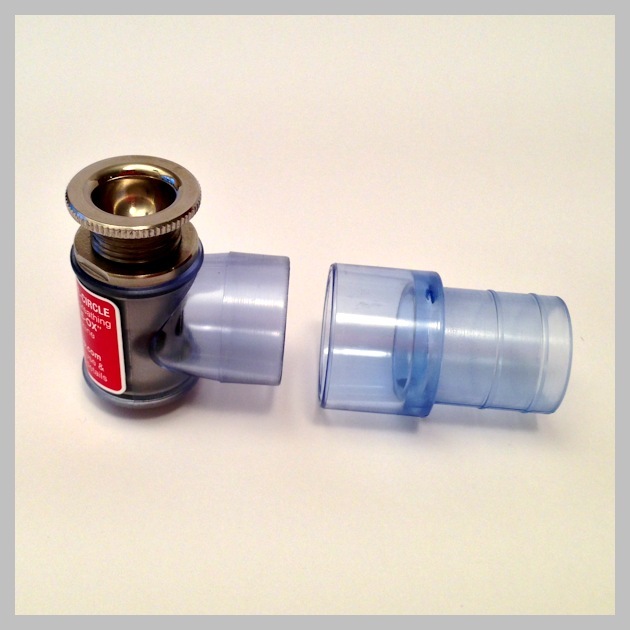 At the same time the expiratory valve is totally self-regulating requiring no adjustment. 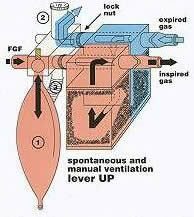 By scavenging expired gases at the exhaust valve, theatre pollution is fully controlled. The unique differences of the Humphrey ADE-circle system, its design and use in clinical practice is described below by the designer, Dr David Humphrey. This may be downloaded and copied for educational purposes though photographs and diagrams remain copyright of the author. Low flow anaesthesia has very significant benefits. Lower fresh gas flows (FGF) proportionately reduce costs and minimize air pollution both in theatre and the atmosphere. Benefits to the patient include warmed humidified gases. In the past 10 years there have been significant improvements in the design of anaesthetic equipment such that FGFs as low as 300 ml/min are safe. As the average FGF in veterinary practice is currently around 2 l/min, low flows averaging around 500 ml/min would save the majority of vets as much as 75% of their running costs. This information sheet summarizes the research and advantages of the Humphrey ADE-circle system (1) which achieves these goals either with or without re-cycling. Since 1981 it has been widely used in medical practice (estimated 20 million anaesthetics). It is now increasingly being used in small animal veterinary clinics (2) since its introduction in the UK in 2000, and is in the syllabus of most veterinary and nursing colleges. Most vets and vet nurses will be familiar with the semi-closed systems such as the Magill, Lack, and Bain systems for spontaneous respiration in larger animals, and the T-piece for small animals. Fresh gas flow (FGF) requirements for the Magill and Lack are set at about 150 ml/kg/min (respiratory minute volume), being much more efficient than the Bain and T-piece which require 300-500 m/kg/min (2-3 times minute volume). Even for a cat of 5 kg a FGF of 1.5 l/min is required, and more for larger animals. Above 10kg mass re-cycling gases through soda lime is usually employed, though many absorber canisters are poorly designed and inefficient. The Humphrey ADE & circle system (Fig 1) has been developed to combine and improve on the advantages of all these systems. In either the semi-closed or recycling mode (with the soda lime canister) it is significantly more effective and efficient than any alternative. In the semi-closed systems that do not rely on re-cycling, the first requirement for efficiency is achieved by positioning the reservoir bag on the inspiratory limb which permits fresh gas to be saved during expiration (Fig 2). Secondly, for the theoretically minimum FGF required to ventilate only alveoli, systems must be designed to save and re-use “dead space gas” (that gas which fills the trachea and airways but never reaches the alveoli). If saved, dead space gas during anaesthesia may contribute up to 50% of the next breath. Moreover if it is re-used, the patient benefits as this gas has already been naturally warmed and humidified in the airways. None of the commonly used systems achieve these ideals. In contrast the ADE system achieves both these goals, particularly due to a new and unique design of exhaust valve. 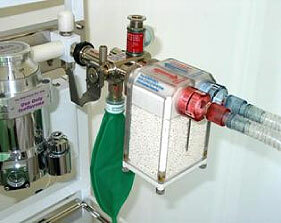 The Bain and T-piece systems are similar in design with a reservoir bag on the expiratory limb (Fig 3). Unfortunately both function very inefficiently for two reasons. As there is no reservoir on the inspiratory limb, “dead space gas” is completely lost as it is vented first along the expiratory limb where it mixes with the previous breath and passes out through the exhaust valve. Also adding to its inefficiency, fresh gas is wasted during the whole of the expiratory phase as it can only flow into the expiratory limb; here it mixes with expired gas full of carbon dioxide gas coming from the alveoli. As the expiratory cycle is about two thirds of the respiratory cycle, nearly 70% of the fresh gas flow is lost this way. Only by increasing FGFs to 300-500 ml/kg/min can rebreathing this mixture containing carbon dioxide be avoided. The resulting efficiency of these two systems is only about 25%! The Magill and the Lack (including mini-Lack) systems are more efficient, the main reason being the reservoir is moved to the inspiratory limb. The major benefit is that all fresh gas is now conserved in the reservoir bag. In addition “dead space gas” can vent along both the inspiratory and expiratory limbs as it can also flow in the direction of the reservoir bag now relatively empty from the breath just taken in. Thus in early expiration a little dead space gas is preserved though much will be lost to the expiratory limb as the exhaust valve opens as soon as expiration starts. Maximum efficiency is therefore not achieved, these systems being about 70% efficient. The development of the Humphrey ADE system retains the advantage of positioning the reservoir bag on the inspiratory limb (Fig 4), but becomes nearly 100% efficienct due to the new 4-phase exhaust valve which saves as much dead space as possible (Fig 5). Standard exhaust valves on the Lack or Magill systems have “two phases” such that they are either “open” or “closed” with the valve seat lifting off a knife-edge rim. The new valve on the ADE-circle system is designed with a sleeve or chimney around the rim and opens and closes in four distinct phases. Such a simple design modification confers many advantages in efficiency and function. In addition to those described below, the orange spindle connected to the valve seat is visible at the top of the valve (Fig 5); this lifts with expiration enabling respiration to be monitored. Putting a finger on it closes the valve and allows manual ventilation without needing to screw the valve cap down. To find out if the ADE system with the new 4 phase valve was as efficient as the theory predicted, a study in 1999 involving 535 cats and dogs was conducted. Using the system in the semi-closed mode (without absorber), cats and dogs under 10 kg were anaesthetized supplying a FGF of only 600mls/min to the cats and 1 l/min to the dogs. This supply proved to be enough for all the animals, without any evidence of rebreathing of any carbon dioxide from the last breath (3). Further studies have confirmed that the average FGF can be reduced to 70-100 ml/kg/min; this is now used as a general guide (see conclusion below). The fresh gas chart can be found below the conclusion. Download a useful A4 chart with the current fresh gas flows recommendations and user instructions – laminate it and hang it with the ADE system. The document belongs to Anaequip-Vet UK but may be downloaded and printed for the practice. The document may not be altered in anyway nor copied (contents or pictures) for monetary distribution. The intellectual property and Copyright belong to Anaequip-Vet UK. I agree to the above Terms and Conditions and acknowledge that full ownership belongs to Anaequip-Vet UK. Perhaps most attractive is the reduction in costs as the FGFs of 1 l/min or less compare with the 2-3 l/min average often used. 75% savings are therefore quite feasible. The ADE-circle system offers advantage to patient, staff and the environment. As soon as fresh gas flow needs to be more than 700 ml/min for a larger animal (over 7-10kg), it becomes increasingly worthwhile to re-cycle gases to reduce costs and pollution. A labrador dog may require 2-3 l/min even on the ADE system, and an Irish wolf hound even more. For these heavier animals, the ADE system is designed to allow a soda lime canister (complete with one-way valves) to be quickly and easily attached with just two lock nuts. Expired gas is returned to the canister where it can either pass through the soda lime to be re-used, while any excess is eliminated through the exhaust valve. Normally the exhaust valve on other circle systems has to be adjusted by fine-tuning it to balance the fresh gas inflow with the gas loss through the valve. In contrast the 4 phase ADE exhaust valve is self-regulating without the need for any adjustment, as during the initial phase of expiration all gas is re-cycled first before any excess gas is dumped (phase1). Consequently whatever the FGF, the reservoir is always filled first, making its use very easy in veterinary practice. After induction at 30 ml/kg/min the FGF can be reduced to just 10 ml/kg/min; for a 30kg dog that is only 300 ml/min! C Gorman : UK Vet July 2001, Vol 6, No4, p34 (Small Animal Equipment). Dobromylskyj P: BSAVA Congress 2000. Abstract book. Researched and developed by Dr David Humphrey, a medical anaesthetist.